The download takes about 30 seconds (at 7 Mbps). 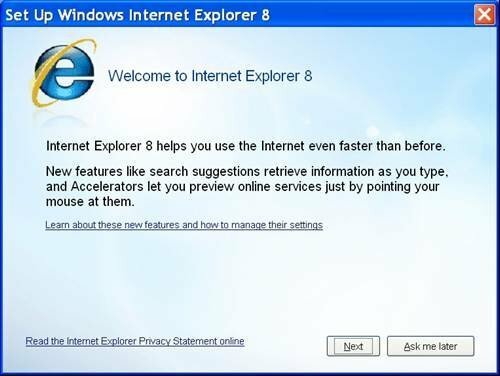 Installing IE8 takes a further 6 minutes. The installation program will reboot your PC, scan for viruses and install any additional updates you may need. Your PC will then update again. Once installed, IE8 will need to be configured. Whe Computer Weekly installed IE8 RC2 we loaded a number of Accelerators, which are web services that let the user access other sites without having to navigate away from the site they are viewing. These can be used for checking items you are watching on eBay or a weather or traffic report. Web slices perform a similar function, but get updated automatically, so you don't need to keep checking the pages for new information. At the time of writing the eBay web slice did not appear to work.